A pair of millennials spruce up a North End space on a serious budget. Teen influencer Alexa Curtis describes meeting designer Jenna-Lyn Croteau at the South End Open Market at Ink Block as one of the best things that happened to her last year. 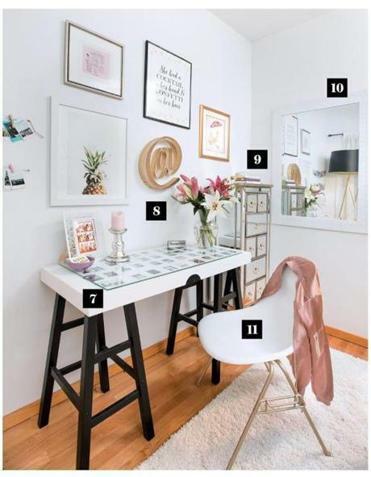 Curtis, the 19-year-old behind the affordable-lifestyle blog A Life in the Fashion Lane, needed pretty much everything for her new 500-square-foot North End one-bedroom apartment. “Alexa was sleeping on an air mattress on the bare wood floor,” Croteau says. Despite the directive to create a “super-chic look in white and gold” with just a $1,000 budget, Croteau was undaunted. “Finding (or making) good, affordable furniture is what I do,” says Croteau, a 22-year-old Boston Architectural College student who launched her furniture restoration and design business, Recycle Refinish Reuse, two years ago. (That Curtis could score goods in exchange for exposure on her blog was helpful, too.) As for Curtis, she loves that friends who live with roommates can consider her place an escape. 1. Blogger Curtis clips Polaroids of her travels around Europe, including the Cannes Film Festival, to three rows of linen string in her bedroom. 2. Playing off the night-stand hardware, designer Croteau used gold spray paint to turn a 50-cent vase into a tiny treasure. 3. Putting her carpentry and upholstery skills to work, Croteau made a wall-hung headboard from plywood, foam, and quilted fabric. She even made the covered buttons. 4. White bedding was a must for Curtis, who uses it as a background for photographing outfits. Ethan Allen supplied pieces for an apartment-makeover blog post and video. Croteau added a plush throw from Walmart. 5. For the picture wall of Curtis’s friends, Croteau sanded, primed, and spray painted four frames purchased on clearance at HomeGoods. 6. The tufted leatherette chair with nailhead detail was a $100 Craigslist find. “This was more of a splurge than a save piece,” Croteau says. 7. Responding to an inspiration photo from Curtis, Croteau fashioned the desk from the top of an old trunk and the legs from two stools. A piece of found glass lets Curtis display snapshots underneath. 8. When Croteau spotted the sparkly gold @ symbol at T.J.Maxx, it became the starting point for the art wall, which includes a pineapple print from Minted. 10. Using paint, Croteau revamped the dark metal frame of an $8 mirror from the Salvation Army. “It reflects light and opens up the space,” she says. 11. The Herman Miller fiberglass desk chair was a roadside find that was a challenge to refinish. “It was orange and very scratched up,” Croteau says, so she primed and spray painted the seat white and the legs gold.